Overview: The Statement of Functional Expense report presents a spreadsheet type view of expense activities shown by function (programs, general management, and fundraising) displayed in columns while the rows provide a view by the type, or nature, of the expense (compensation, depreciation, maintenance, and so forth). Some churches may be required to include the Statement of Functional Expense report along with the Statement of Financial Position and the Statement of Activity. You should check with your auditor or other professional advisors to determine if you need to include this report in your monthly and annual presentations. You also might find the 2018 GAAP Reporting Standards - What you need to know webinar to be helpful in understanding if you need to provide this report, and how to proceed without having to change your current chart of accounts. Approach: Before starting to construct the report, you should identify your programs and support activities. Programs might include such activities as Intercity outreach, local missions, foreign missions, Adult Ministries, Youth Ministries, Mothers’ Day Out, etc. Then, group similar programs together for the report. For example, select groups like Local Ministry, Missions/Outreach, Daycare/School. Two additional columns are required: Marketing, General and Administrative (MG&A) and Fundraising. For natural classifications define broad categories of expense activities, such as Benefits, Program Expense, Utilities/Maintenance, etc. Once you have defined your programs and expense classifications, then you are ready to start configuring the report. 1. Start Shelby Financials and navigate to General Ledger. 2. 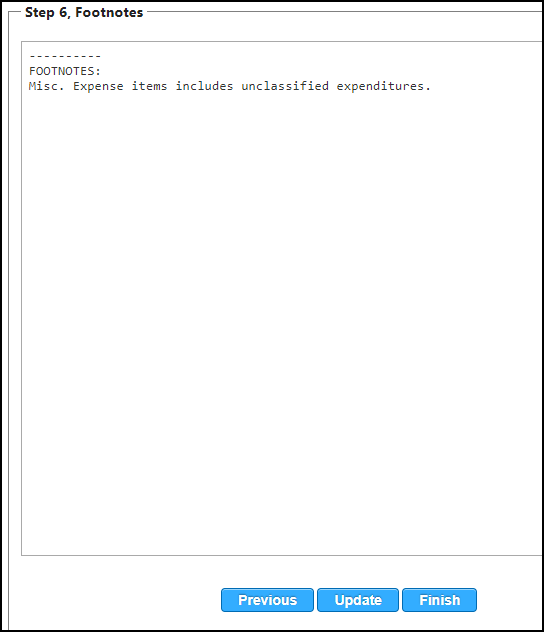 Hover over Modify and select Functional Expense Report, which starts the setup wizard. The program saves your work when you click Previous, Update, or Next buttons. •Include Income in Report? Check the box if you need to include income (seldom used). 3. Click Next to go to Step 2. The wizard includes three undefined classifications. Change the descriptions by just typing over the placeholder descriptions. 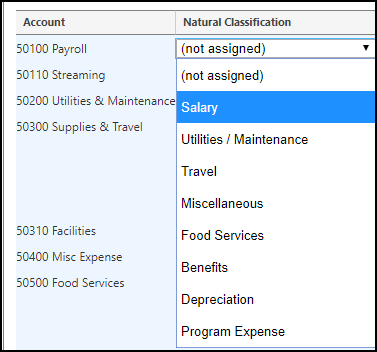 Natural Classifications include descriptions similar to Salary, Utilities/Maintenance, Depreciation, Program Expenses, and so forth. a. Rename the existing classification. b. If you need more than 3, then click the Add New Classification link. c. Delete any Classification that is not needed by clicking the red X icon. d. Change the order of the Classifications by moving the blue icon up or down. 4. Click Next to move to Step 3. The wizard includes three undefined classifications. You can change the descriptions by just typing over the placeholder descriptions. Program Activities include items similar to Local Ministry, Missions/Outreach, Daycare/School, and so forth. a. Rename the existing activities. b. If you need more than 3, then click the Add New Activity link. c. Delete any Activities that are not needed by clicking the red X icon. d. Change the order of the Activities by moving the blue icon up or down. 5. Click Next to move to Step 4. While the wizard includes three undefined activities, you may only need two: MG&A, and Fund-raising. b. If you only need two, then click the red X icon to delete the third. 6. Click Next to move to Step 5. Your chart of accounts might be very simple, or extremely complex. Either way, you might be spending considerable time in Step 5. Therefore, you should review the options in the Step 5 Filters, as shown below. •Account Structure will not show if you do not have multiple funds and/or multiple departments. If it does show, then you will need to select an area from the drop-down box. • Show All shows all account codes based on Account Structure filter. • Show Unassigned shows all accounts that you do not have mapped. •Show Not = 100% shows all accounts where percentages under each activity do not equal 100%. 7. Click Search to move to the list of accounts. The screen shot below shows two accounts that are set up correctly. 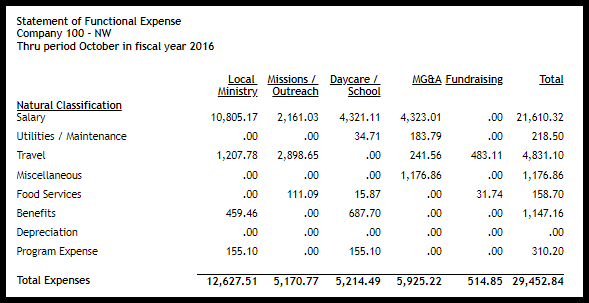 Notice that 50100 payroll totals shows in four columns, Local Ministry, Missions/Outreach, Daycare/School, and MG&A. 8. Use the following steps to allocate a percentage of each account code’s activity to the proper location on the report grid. a. Use the pull-down arrow for the Expense Code to assign the code to the Natural Classification. Here we are selecting 50100 Payroll and assigning it to Natural Classification of Salary. b. Using the pull-down arrow under Activity Assignment, we are selecting Program. c. Using the pull-down arrow in the next column, we select Local Ministry. d. Then we will allocate 50% of Payroll to Local Ministry. e. IMPORTANT NOTE: When moving from the % column notice that the program drops your entry down one row, leaving the top row available to add more distributions. Also, notice that the % assigned column shows 50% in red text indicating there are more distributions needed for account number 50100.
f. Continuing with 50100, we will choose Program again and use the pull-down arrow to choose Missions / Outreach. Also, notice that Local Ministry is not an option because it is used in step 9.d above for account 50100.
g. Enter 10% for this second entry. i. Still working with 50100 but this time don’t choose Program (already used all three available items) rather choose Support and choose MG&A. The program should default to show 20%, which is the balance. 9. Repeat the process using all of your existing expense accounts. a. The Footnotes screen is a large text box. Enter any information needed to clarify entries on the report. For example, how miscellaneous expenses are used, a change in net asset allocations, and so forth. •If you need to correct an entry, change the Natural Classification to “Not Assigned” and start that account code’s distribution again. •You don’t have to do all allocations in one setting. Just click Previous, Update, or Next to save your work. •If you are in Step 5 and need to go back to the filter screen, then click the Filters bar at the top of the screen.